Deborah Gilboa, MD, is a family physician practicing in Pittsburgh, PA, author of four parenting books, featured parenting expert on television and Huffington Post, speaker, and mother of four boys. She advises parents on every conceivable issue, and her straightforward recommendations are unfailingly practical. 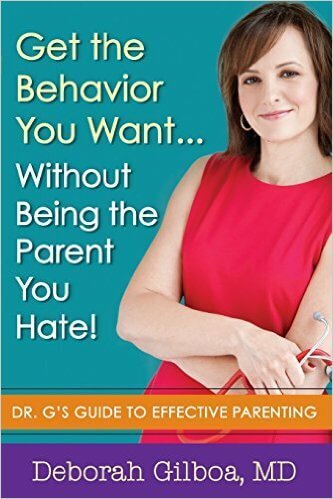 Recently, I discovered her book, Get the Behavior You Want…without Being the Parent You Hate: Dr. G’s Guide to Effective Parenting (2014). Her style is breezy, mom-to-mom truth-telling. The book has 63 chapters, all brief and to-the-point, no fluff. And each chapter deals a single challenge – the kind every parent eventually faces. For example, in Chapter 5 – “Spoiler Alert: What You Do Is More Important Than How You Feel,” she focuses on how to deal with a child who doesn’t feel like doing what he or she should be doing. How a loving parent deals with this situation has enormous consequences. Expressing empathy while not budging on standards or requirements helps a child learn responsibility. Expressing empathy and letting the child off the hook leads to an attitude of entitlement. Not this book. All 63 chapters focus on what to do. I came away believing that a parent could raise a child to be a responsible, respectful and resilient adult by reading this book alone. Regardless of the other fine books a parent may read, this one is a must-have, must-read guide. Also, my new book: How Your Teen Can Grow a Smarter Brain.